"The Emperor has been a prisoner in his own palace since the day that he was crowned, and has remained a prisoner since he abdicated. But now he's growing up, he may wonder why he's the only person in China who may not walk out of his own front door. I think the Emperor is the loneliest boy on Earth." Run Time: 165 min./218 min. The film review is by Mark Zimmer. The Last Emperor is one of the most honored films of the modern era, nominated for and winning numerous Academy Awards such as Best Picture, Best Director, Best Cinematography, Art Direction, Costume, Editing, Score and Screenplay, as well as an equally tall pile of Golden Globes and BAFTA Awards. Ordinarily such a largesse of honors would be a signal to brace yourself for a tedious, awful picture, but Bernardo Bertolucci manages to put together a movie that lives up to these honors and then some, providing beauties for the eye and ear, a thoughtful yet direct screenplay, and riveting performances that tie it all together in a memorable package. That package was initially released on DVD in a miserable transfer from Artisan in 1999, but nearly ten years later The Criterion Collection finally does the picture justice. The story follows dual tracks, the first beginning as three-year-old Pu Yi (Richard Vuu) becomes emperor of China in 1908, only to be ousted in a revolution in 1911, though he was permitted to remain in the Forbidden City for a number of years as a symbol. The second thread, interwoven with the first, begins shortly after Mao consolidated power in 1949 and the adult Pu Yi (John Lone) is interrogated regarding war crimes and collaboration with the Japanese, as the titular emperor of the puppet state of Manchukuo. Along the way, Pu Yi is influenced by an English tutor, Reginald Johnston (Peter O'Toole), Pu Yi's Empress (Joan Chen) and Wen Hsiu, the first concubine (Wu Jun Mei), as well as the tumult of history as China moved haltingly from a medieval life to a modern one, through a crucible of fire and war. Pu Yi's tale is an interesting and complex one, beginning with the charming scenes of a toddler in charge of an empire, but mostly interested in playing. But before long, it becomes clear that he is more a prisoner than a ruler; part of that is due to the rigid requirements of tradition and court practice, part is due to the corrupt workings of the eunuchs who actually run things in the Forbidden City, and part the fact that after the 1911 revolution he was in reality a prisoner, a possibly useful hostage kept around for a variety of purposes. This gives rise to a truly tragic scenario, as Pu Yi becomes used to the adulation and sight of thousands kneeling before him, and this makes him susceptible to being taken in by the Japanese to serve as their "Emperor" of Manchukuo. But when it becomes clear that they intend he will be only a figurehead, Pu Yi's resistance produces untoward results that send him into a vortex of darkness. The corrupting influence of the Japanese is palpable in these sequences, as they turn the screws first by introducing the Empress to opium, culminating in a devastating punishment for his willfulness. Bertolucci obtained unprecedented cooperation from the Chinese government for filming, being given the ability to shoot within the Forbidden City itself, making the production values marvelous right there. But the thousands of ornate costumes layer heavily upon that, making an amazing visual experience that is really given its due in high definition. The ornate golds and reds of the early scenes stand in stark contrast to the greys of Communist China, which emphasizes just how low Pu Yi has been brought (though arguably the rest of the country has been brought just as low in the paroxysms of Mao's mad programs, as the overall greys emphasize). John Lone as the adult Pu Yi is terrific, with a generally controlled performance, but often displaying childish emotions and insecurities, combined with a furious temper, just under the surface. Vacillating between hedonistic pleasures, love of his country and resentment at the way he has been treated, Lone gives a complex and well-rounded portrayal. Joan Chen (best remembered as Josie Packard of Twin Peaks) is devastating in her much smaller role, despite heavy makeup that limits her expressiveness. She nevertheless brings out many subtleties in the part, wanting to support her husband but unable to make him see the darkness of the route he has chosen to follow. O'Toole carries a properly smug British superiority as he attempts to Westernize the emperor, with just enough distance to keep his attitude as one of bemused tolerance rather than outright mockery. Composer and rock star Ryuichi Sakamoto is also memorable in the role of Amakasu, the Japanese liaison to Manchukuo, serving up the most intense performance in the movie. There are plenty of astonishing visuals, as well as many slightly cryptic ones; several sequences involve Pu Yi feeling a desire to touch others, but only through fabric, keeping himself separate. Whether this is his design, or a limitation based upon his position, is left ambiguous. But the whole is at once memorable, joyful and thoughtful, and is indeed enjoyable on many levels. Image Transfer Review: Previously available in Region 1 only in an abysmally-mastered non-anamorphic transfer of the television cut, The Last Emperor is finally available on DVD in a form that wont make your eyes bleed. Unfortunately, it's also not necessarily the transfer you've been waiting for. Cinematographer Viittorio Storaro won an Oscar for his work here 20 years ago, but has since decided the 2.35:1 aspect ratio in which the film was shot is the wrong one�he's made known his preference for a "universal" aspect ratio of 2:1 and several of his films (including Apocalypse Now Redux) have been cropped at the sides for presentation on DVD. Whatever his reasons for preferring the boxier image, it's patently obvious that The Last Emperor was not framed to be shown in this format. Often, characters skitter about the very edge of the frame, their faces cut in half as they deliver their dialogue. Shots that promise pleasing symmetrical vistas feel closed-in and stuffy rather than epic. If you want proof, check out the film clips that appear on the two discs of supplements. Presented in the original 2.35:1, they are far more pleasing to the eye. Aspect ratio issues aside, this remastered DVD offers a beautiful picture (making the cropping all the more frustrating). The source print is close to perfect, with fine, natural-looking grain that shows off the varied hues of the production design and Storaro's cinematography wonderfully. Detail is very strong, even in wide shots with many hundreds of extras, and other than a hair of edge enhancement visible on occasion (including onscreen titles), I don't have any digital anomalies to quibble about. Criterion has assured the film's fans that this is the cinematographer's preferred transfer, and Bertolucci has signed off on it as well. Far be it from me to tell the "master of light" that he doesn't know what he's doing, but I think the director of photography has done wrong by one of his finest works. Is it a reason not to buy the DVD? It's up to you. Outside of importing a copy from Region 2, this is the best you are going to find in this country. What a shame. The grade does not take the aspect ratio into consideration, despite the fact that it was a significant distraction as I attempted to enjoy the movie. Audio Transfer Review: The DD 2.0 soundtrack is a good one for its vintage, with clear dialogue and a strong presentation of the score by David Byrne (of the Talking Heads) and Ryuichi Sakamoto. Extras Review: Portions of the extras review are by Mark Zimmer. One of Criterion's most lavish (and expensive!) releases yet gives The Last Emperor his due. Four discs collect a bevy of supplemental material, not the least of which is the extended "television" cut, almost an hour longer than the theatrical version. The impact of the extra footage isn't as strong as you might imagine based on the sheer volume of material. Though there are excised characters (including a drug-addled man who haunts Pu Yi in prison) and lengthy additions (particularly to the section on the puppet state of Manchukuo), many scenes are simply longer, offering a few minutes more here and there. It's not really a "director's cut" (notice which version includes commentary), but a richer, meatier, but not necessarily tastier version of an already fine film. Note that this is the only way to get the longer version at the moment�it didn't make it to the Blu-ray. The theatrical cut offers a commentary from director Bernardo Bertolucci, producer Jeremy Thomas, screenwriter Mark Peploe, and composer-actor Ryuichi Sakamoto. Deftly edited together in the usual Criterion style, it contains plenty of background on shooting in the Forbidden City and the travails of working in China, as well as the production design. Bertolucci's English is pretty good and readily understandable, which helps. The supplements start off with The Italian Traveler, a film by Fernand Moszkowicz that covers Bertolucci as he attempts and fails to make a film of Red Harvest in Hollywood, and turns instead to the Far East for inspiration. Unfortunately, there are too many arty pretensions indulged in, and precious little information as to why exactly this was where Bertolucci turned his attention. A featurette incorporates about eight minutes of video footage shot by Bertolucci himself in China, while scouting locations and looking for interesting faces to use in the film. More substantive is The Chinese Adventure of Bernardo Bertolucci, which looks at the making of the film and the various frustrations in dealing with the enormous cast in a country not used to Western-style moviemaking. Information starts coming in serious doses with Making The Last Emperor (45m:05s), as it includes new interviews with Storaro, editor Gabriella Cristiani, costume designer James Acheson and art director Gianni Silvestri. The latter two in particular offer some insights into just how carefully Bertolucci controlled the look of this film. The Southbank Show (1h:06m:03s) is a period making-of that aired on British television, with excellent historical background about the film, including interviews with Pu Yi's brother, and extensive footage from the set. These two are the best extras and where you'll want to turn first if you don't want to explore the entire set at once. More interesting material is included in a 25m:05s interview with co-composer David Byrne, who is humorously effacing about his efforts, and notes that his music oddly enough sounds more Asian than that of Sakamoto, who didn't feel compelled to add Chinese elements. Beyond the Forbidden City (45m:15s) is a fascinating journey through the history of China through this period, beginning with the Boxer Rebellion and extending to the Cultural Revolution, with ample coverage of Pu Yi and those within his circle. Face to Face (30m:05s) is another British television episode from 1989 devoted to interviewing Bertolucci about his career and his influences. The presentation is very strong, with elegant menu designs that carry over to the cardboard gatefold packaging, and a thick 90-page book (not included with the Blu-ray) loaded with photography, an interview with the production designer, memoirs of the shoot from Bertolucci, and more. 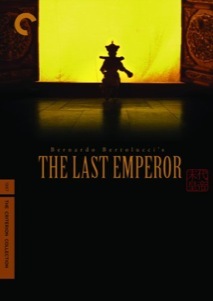 Bertolucci's intimate epic The Last Emperor remains one of the best films of the 1980s, and this lavish four-disc set is likewise among the best ever produced by the venerable Criterion Collection. Questions about the presentation of the film aside, the sheer volume of supplements�from the extended television cut to half a dozen lengthy documentaries�are enough to justify the hefty price tag.